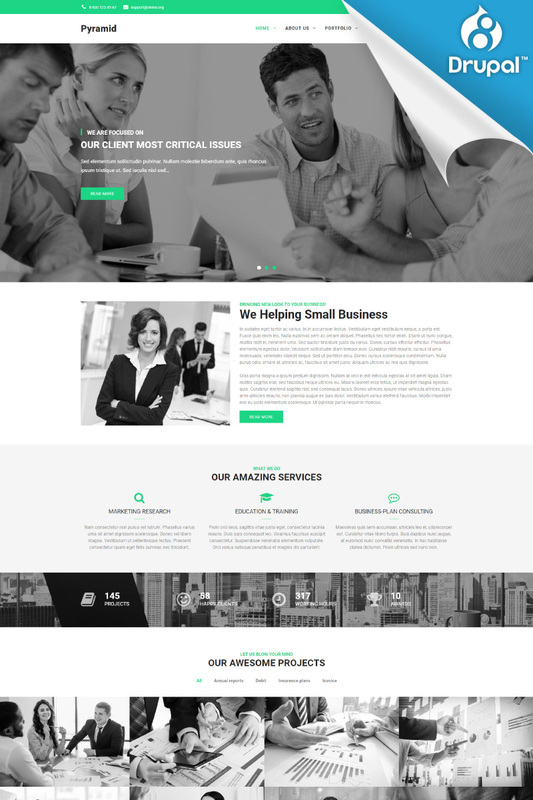 Pyramid is a professional multipurpose Drupal 8 template for any business websites. It features a minimalistic design that is perfect for showcasing your work. Template can be used for business, corporate, marketing and other types of sites. Template is built with Bootstrap 3. So feel free to use any Bootstrap classes, including responsive grid. Your site will have great look on retina displays as well thanks to using Font Awesome icon font. Our custom blocks can help you to create various layouts and styles of block without any coding knowledge. Build your blocks, including complex titles, media, map and background variants. The styles and layout are realy not limited just as demo. Theme demo incledes 3 Home page variations, 2 Portfolio page variations and 4 post types variations. Template is fully customable, so you can add your own page variations for any page or post types displays. Change the look of your site with ease, in total control with or without coding knowledge. Hide or show page elements, choose unlimited color schemes or add your own CSS styles. Do not limit yourself! Thanks to detailed documentation you will be able to install and customize template without special knowledge. You will get a clear picture of all elements included into our template. To help you speedup the setup process, we included demo replica files within download package. It will help you to understand better how demo being put together. Just follow instructions and install your site in few clicks.